So, after the Fudge Line-up from Mouth Watering Monday earlier this week, I had to try one out! This recipe was so easy and so good! It had the perfect texture of soft, chewy and crunch! You are going to love this fudge! Combine the bittersweet chocolate chips, sweetened condensed milk, butter and salt in a glass bowl and melt in the microwave, stirring at 30 second intervals. Once chocolate mixture is completely melted, immediately stir in marshmallows, nuts and additional chips. Pour mixture into a greased 8 x 8 dish and press down to spread out evenly. Cover and refrigerate at least one to two hours, until completely firm. Cut fudge into squares and store in refrigerator until ready to serve. i love the combination of sweet and salty - yum! Brownies are the best dessert ever! Thank you! 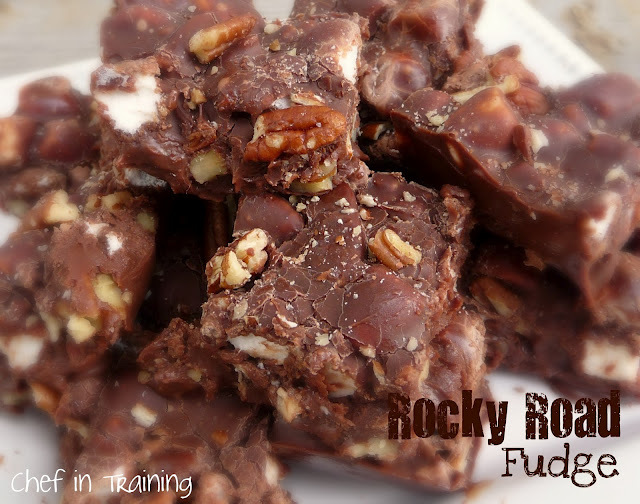 Growing up my favorite ice cream was Rocky Road. This sounds wonderful, Thanks! Looks wonderful, will be trying this soon! Oh goodness. these are really mouth watering...I'm drooling over your picture! It's 6:30 in the morning and I want fudge! My mouth is actually watering!!! These look wonderful!! Just made this yesterday, tastes fantastic, super rich! The only thing I would suggest is lining the pan with plastic wrap or foil, Im having a hard time getting it out of the pan. Trying a wash cloth with very hot water to put over the upside down pan to see if that might help loosen it a little. Thanks for the recipe! Do you need the 1/2 cup of semisweet chocolate chips? When did you add them? I don`t see them! Thanks!